Serving the Madison, WI area with landscaping services for over 20 years. 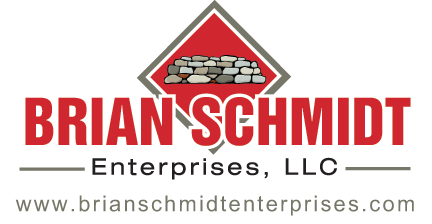 Brian Schmidt Enterprises, LLC, was founded in 1989 by Brian Schmidt, after working in the landscaping industry for over 20 years. Brian is involved with his company and is the main contact and handles most services. His top priority is meeting with clients to submit a free quote and offer ideas for a beautifully landscaped yard. He accommodates to people and their busy lives, meeting with clients during weekdays, weekends or evenings. He also personally submits all invoices and bids, supervises all crews and handles all follow up situations with the clients. Brian Schmidt Enterprises, LLC, stands out from other competitors by offering a large variety of services and professional work at a reasonable price. We have up to 20 employees whose individual duties and years of service include all types of landscaping, excavating, building of retaining walls, trucking, shorelines, installation of paver patios, installation of driveways, and snow plowing services. Our employees have a family value relationship that is reflected in the services and work ethics we provide. Hard work ethics are expected and it shows in the quality end result. We work with residential, commercial, and contractors of all kinds. We pride ourselves on offering personal and professional services to all clients. Your time browsing the site is appreciated. Brian Schmidt Enterprises, LLC, hopes to hear from you soon. Complete Landscaping Services for Residential, Commercial, and New Construction. Serving Dane, Columbia, and Sauk Counties. Fully Licensed and Insured.